This super creamy rice pudding, that happens to be vegan too, is total comfort food with a tropical twist. Coconut milk not only makes it rich and creamy, but adds that tropical taste to it, which is just enhanced with the sweet caramelised pineapple on top. 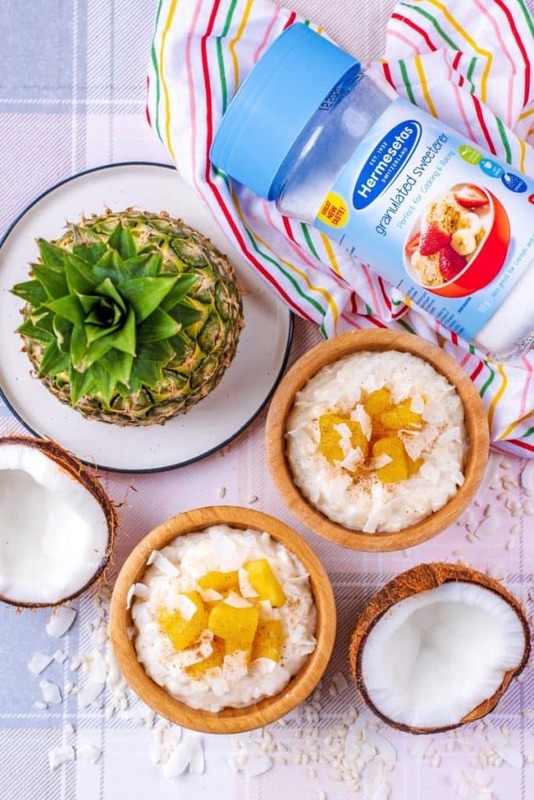 What’s even better is this Coconut Rice Pudding is much lighter than most, as we have sweetened it with Hermesetas Granulated Sweetener. I am sure we all have happy childhood memories of rice pudding. It was always served up in the school canteen (topped with jam) and we would also open a can of it on a weekend as an after Sunday dinner treat. We have taken a childhood classic and given it a tropical twist with coconut and pineapple. It can be tempting to just buy a tin of it, but it is so easy to make it yourself with just a few ingredients that you probably already have in your cupboard and fridge. Making it yourself means you can control exactly what goes in to it too, and make it lower in sugar. We swapped the sugar for Hermesetas Granulated Sweetener and not only is this a lower calorie dessert, but you won’t even taste the difference. 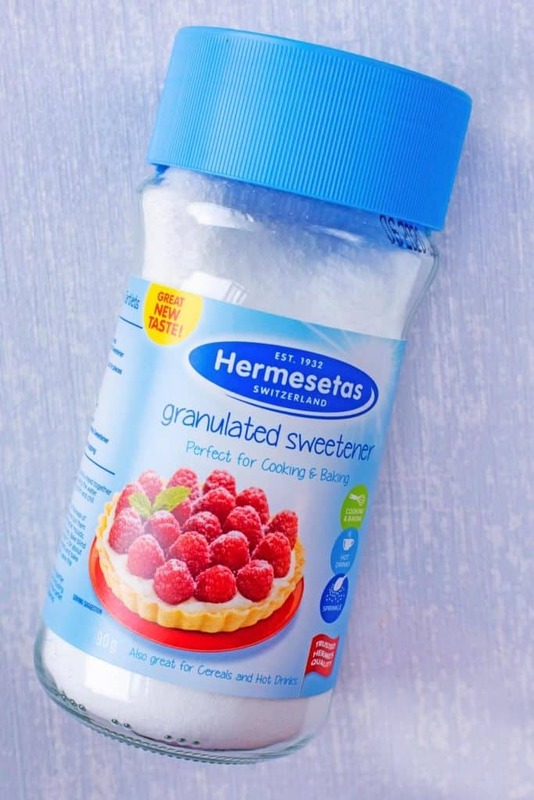 Hermesetas is a sugar alternative and one teaspoon provides the same degree of sweetness as a teaspoon of sugar, but with no or a very low amount of calories. Switching sugar to low calorie sweeteners, like Hermesetas, can reduce your daily calorie intake by 10% and lead to a statistically significant weight loss of 0.2kg (0.44lbs) a week. The best thing is, it’s such a simple swap as you just replace it for the same amount of sugar you would have used. Don’t just take our word for it – NHS Choices says: “Like sugar, sweeteners provide a sweet taste but what sets them apart is that, after consumption, they don’t increase blood sugar levels”. I have struggled with sugar crashes in the past and desserts like this would usually cause me to have a sugar crash about an hour later, but that doesn’t happen since I have made this swap. We have been using Hermesetas Granulated Sweetener in our baking, sweet breakfast and hot drinks for about a year now and I have noticed such a difference in my energy levels, but no difference in taste of our recipes. It is readily available too and you can pick it up in Sainsbury’s, Waitrose, Savers and independent pharmacies and it’s also easy to use in all your favourite sweet treats. Have you tried our Apple Hand Pies or Healthy Chocolate Raspberry Brownies? They both use this sweetener. All Hermesetas products are heat-stable, so they won’t lose their sweetness even when exposed to the high temperatures involved in baking. Don’t be nervous about making this swap with all your favourite recipes, as it’s a really easy swap. Head over to the Hermesetas website to find some more childhood memory recipes – sweet but low in calories, supporting healthy diet swaps. Can You Freeze Coconut Rice Pudding? It will keep for about 2 days in the fridge (make sure it has cooled completely before putting it in the fridge). You can also freeze it in individual portions and then reheat in the microwave or on the hob after totally defrosting. Can You Cook it in the Slow Cooker? Yes, you can cook this in the slow cooker, but the texture will be a bit different and a little more mushy. Simply stir everything together in the slow cooker and then cook on high for 2 – 2.5 hours stirring every hour. You may need to add a little more milk if it is too thick. 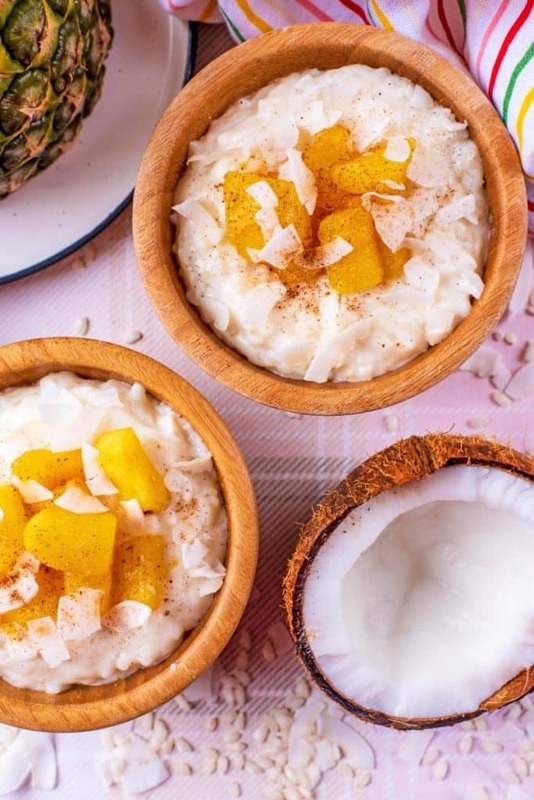 As the main flavour of the rice pudding is coconut, we wanted to stick with the tropical flavours and went with pineapple and some extra coconut. But you could really use anything. Not a fan of pineapple? Swap it for mango and cook it in the same way. You could even caramelise some bananas to go on top. Keep it simple and go with some homemade jam or chocolate chips, or it is good plain too. We have also topped with with peanut butter, berries, chopped nuts and pomegranate. One: Put the rice into a pan. Two: Add the coconut milk, skimmed milk, 3 tbsp Hermesetas Granulated Sweetener and vanilla extract. Three: Put on a medium heat and bring to the boil. Turn down to a simmer and gently cook for 35-40 minutes, stirring every 5 minutes, until it has thickened. 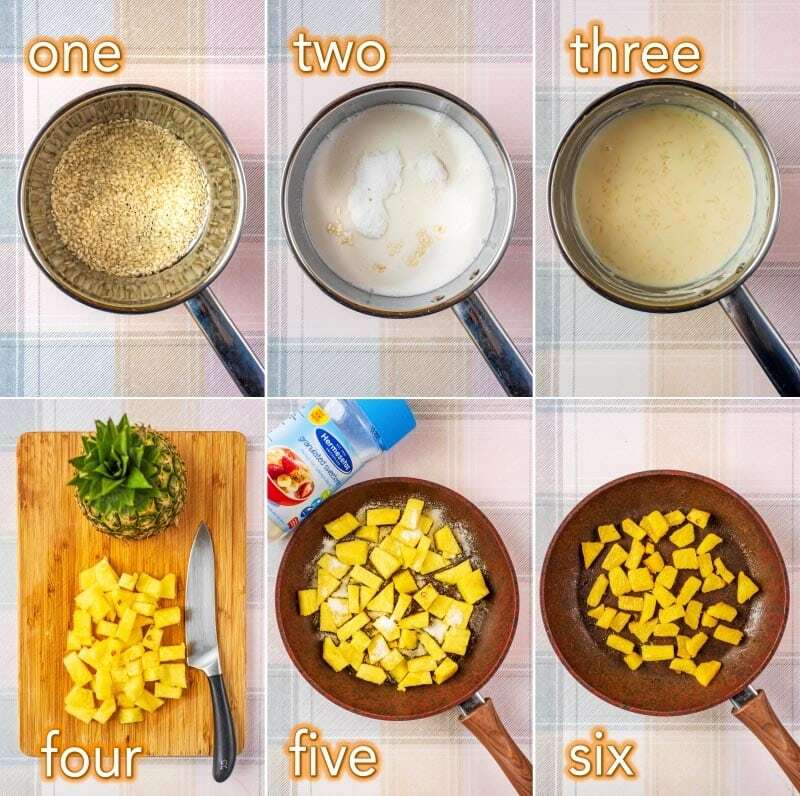 Four: Chop the pineapple in to 1 inch/2cm chunks. Five: Put the pineapple and rest of the sweetener into a frying pan. Six: Gently heat for 10 minutes. 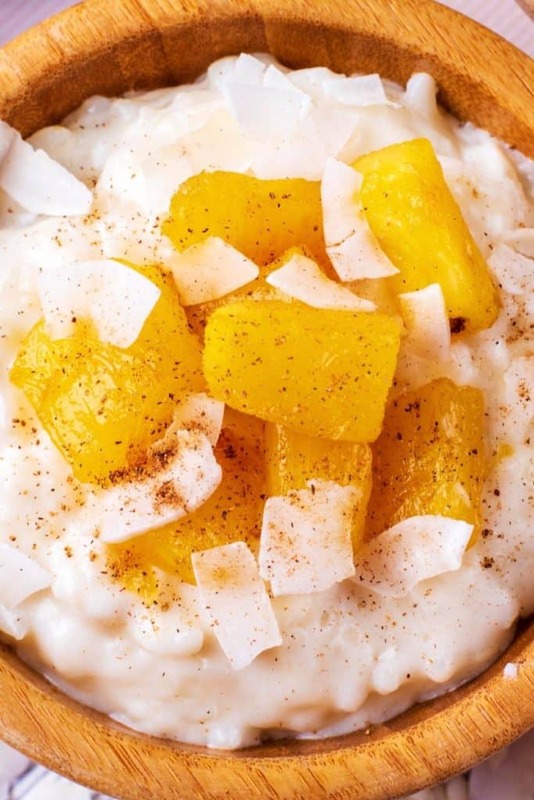 Seven: Spoon the cooked rice pudding in to bowls and top with cooked pineapple and coconut. You can swap the coconut and almond milk for any kind of milk, but it won’t be as creamy. Swap the pineapple for mango, but cook it in the same way, to mix things up a bit. You can cook this in the slow cooker on high for 2-2.5 hours, but you might need to add a little bit more milk towards the end if it is too thick. You can freeze this in individual portions or keep it in the fridge for up to 2 days. Just make sure it has cooled completely before putting it in the fridge or freezer. If you’ve tried this rice pudding recipe, or any other recipe on the blog, then let us know how you got on in the comments below, we love hearing from you! You can also FOLLOW US on FACEBOOK, TWITTER, INSTAGRAM and PINTEREST to see more delicious recipe ideas, behind the scenes shots and also what we are getting up to. 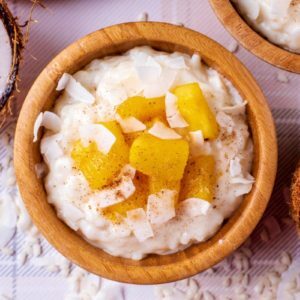 This super creamy Coconut Rice Pudding, that happens to be vegan too, is total comfort food with a tropical twist. Put the rice into a pan. Add the coconut milk, skimmed milk, 3 tbsp Hermesetas Granulated Sweetener and vanilla extract. Put on a medium heat and bring to the boil. Turn down to a simmer and gently cook for 35-40 minutes, stirring every 5 minutes, until it has thickened. Chop the pineapple in to 1 inch/2cm chunks. Put the pineapple and rest of the sweetener into a frying pan. Gently heat for 10 minutes. 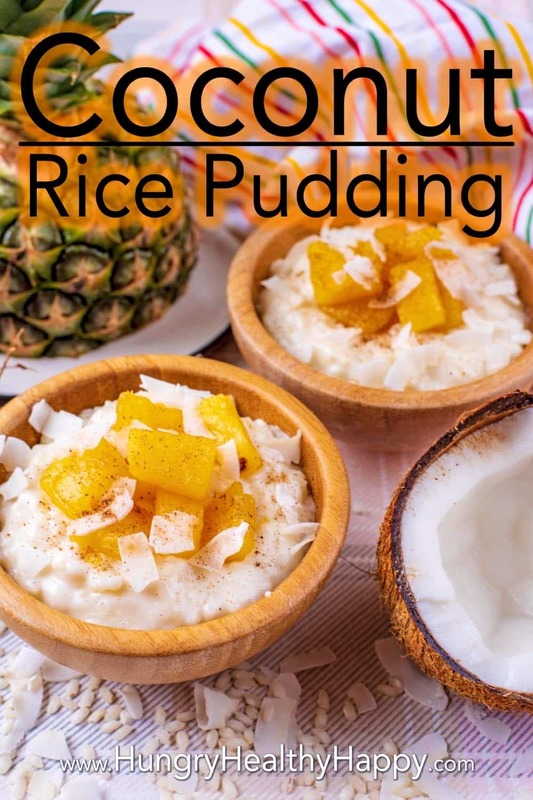 Spoon the cooked rice pudding in to bowls and top with cooked pineapple and coconut. You can swap the coconut and almond milk for any kind of milk, but it won't be as creamy. Love the idea of using coconut milk! What gorgeous flavours this must have! This looks so good! I fell in love with coconut rice when I was in Columbia last year and am so excited about this recipe! I LOVE the idea of using coconut milk in rice pudding. It’s auch a simple idea, but it sounds positively delicious!! I’ll have to try this soon!! 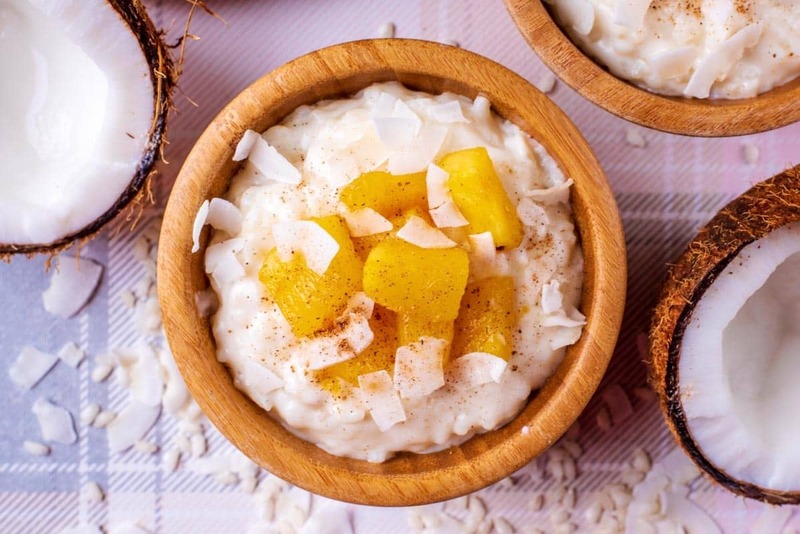 Rice pudding is pure comfort food and I love this tropical take on it!! Such fun flavors! Yes please! I like the sound of this dish. I think we could all use a little less sugar in our diets so this is perfect for what I am planning for dishes this weekend. Cheers! !